Choose from our wide range of traditionally styled pool dining tables. Using turned legs these tables are designed to complement a more traditional interior space. Traditional English pool tables are one of our specialities at Home Leisure Direct, and we offer a fantastic variety of traditional English pool tables for home and commercial use. Our traditional pool tables can either come in a free play version (no coins needed) or with a coin mechanism. Choosing a pool table with a traditional look can totally change the décor of a room, especially if you select your furniture around it. If you're looking to create a classic aesthetic with a more traditional leaning, our range will certainly have the perfect table for you. All of our luxury traditional pool tables are available with installation by fully qualified fitters who are experts in this field and are trained to the highest standards. All of our high end tables are fully customisable, allowing you to change both the cloth and cabinet colours to suit your personal tastes. We stock tables from all the top manufacturers including Sam, Longoni, Brunswick, Chevillotte, Billards Plaisance, Billards Monfort, Billards Toulet, Aramith, Buffalo and many more. Our selection of traditional pool tables has been specially selected to represent a classic era of pool. These tables evoke the traditions of pool with its centuries of history and evolution. Please use the links at the top of the page to navigate to these sections, or alternatively browse below for our entire range of Traditional English Pool Tables. All of our pool tables come complete with free delivery and free accessories, so you have all you need to get started once you recieve your table. 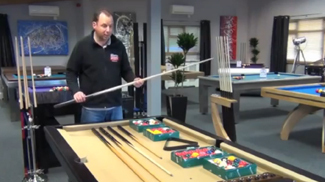 Visit our Pool Table Showroom to look at a superb collection of pool tables, try them out and get some first hand advice on the right one for you. Our friendly staff are always on-hand to point you in the right direction for your perfect pool table. We carry all the top brands available in the market today. There is a thriving community of UK-based manufacturers which have been in the industry for years. We also sell traditional English-style pool tables from all around the world, coming from Spain, Italy and France. Please use the links at the top of the page to see all of the manufacturers' tables we offer, and to navigate to their dedicated pages. Many models, finishes, and brands are exclusive to Home Leisure Direct, and are therefore unavailable through any other retailer. All of our pool tables come complete with free delivery and free accessories. We have years of experience behind us and have travelled the world meeting with the leaders in this field. We are happy to discuss at length your requirements and make qualified recommendations. We consider ourselves to be the market leaders in the UK. Put us to the test and we are certain you will agree.